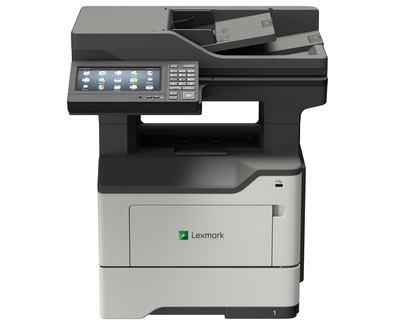 The Lexmark MX622adhe offers printing at up to 50 pages per minute*, superior print quality, enhanced security and standard hard drive. Robust and reliable, Lexmark multifunction products are built to work anywhere from showroom to warehouse with few interventions. Keep going with long-life components, replacement cartridge yields up to 25,000 pages** and a maximum input capacity of 2,300 pages. When performance meets simplicity, you get more done. The intuitive 7-inch tablet-like colour touch screen makes your tasks easy, and it’s the gateway to built-in productivity apps that save time and improve efficiency. With up to 50-page-per-minute printing and a skilled scanner that can accurately capture up to 100 images per minute, even with mixed originals, you’ll get what you need in a flash. It can even staple for you with its optional integrated stapler. A 1.2 GHz quad-core processor with 2 GB of standard memory gives you the power to do a combination of faxing, printing, copying, and scanning for maximum productivity. And you can be confident that your complex file with images, charts and small print will look just the way you designed it. Some laser printers struggle to print grey text that’s easy to read—not the MX620 series. Its innovative font outlining technology makes even the smallest grey text crisp and clear.